For our first night in a tent since we were adults, we slept fine. Justin got up around 3:30, and Crystal woke up at 5. It would have hard to sleep any longer than this, because there was lots of activity, as the camp was absolutely packed. We had arrived fairly early the day before, and it had really filled up after we got there. We heard lots of discussions from the campers near us, including some talk of people throwing up, which was nuts since we were "only" at 9500 feet (2895 meters). We had a big breakfast, then got on the trail around 7:30. Along the hike, which was still through a little forest, we played leapfrog with a group of 4 gentlemen from Ohio. They were walking faster than us (well, the pace Joseph was setting for us), but they kept stopping while we kept plodding along. 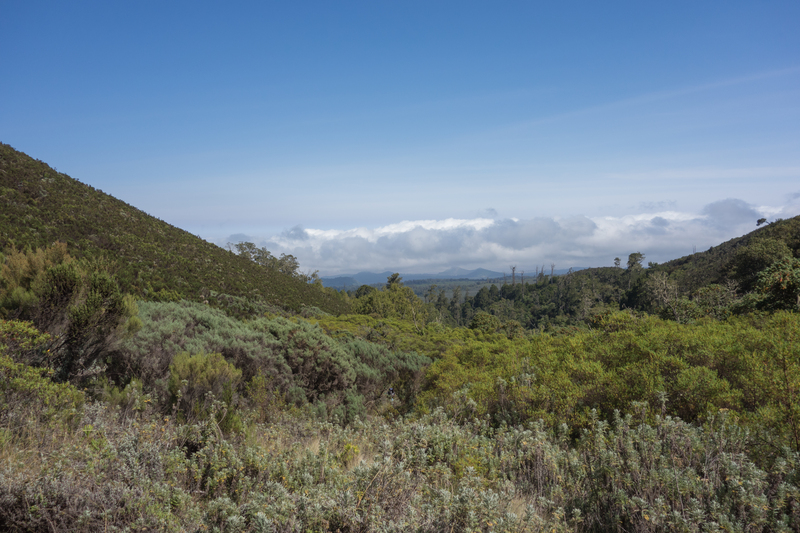 After an hour or so after leaving camp, the trail quickly changed from forest to moorland. 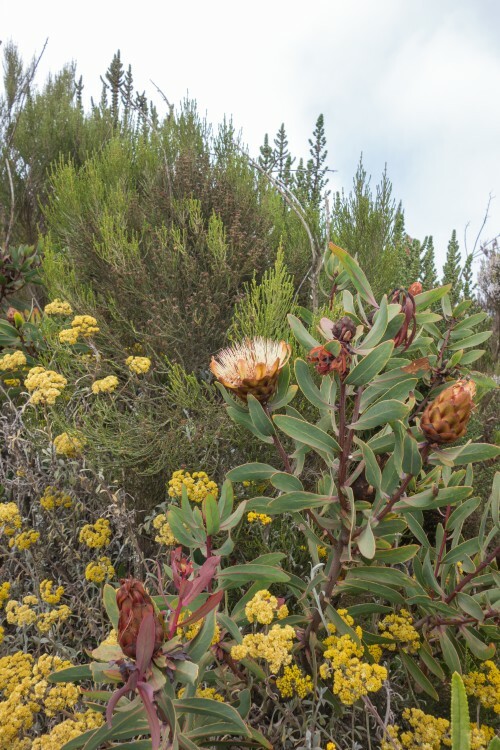 There were a number of proteas, ericas, and other moorland plants. There was also dust everywhere. Lots and lots of dust. 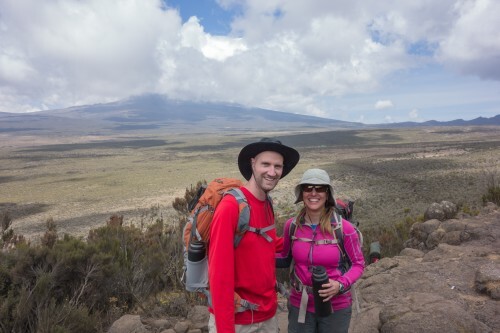 It wasn't helping that we were getting passed by everyone - not just porters, but other trekkers as well. That meant that we had a steady stream of dust always right in front of us. It was also very frustrating that we had to keep stopping for everyone. We got stuck behind some people walking, incredibly, even slower than us, but Joseph refused to pass them. Justin was about to lose it, but then we arrived at the spot for lunch. Lunch was cream of chicken soup, sandwiches, pasta, and guacamole. After lunch, it was quite a bit more steep, and Crystal was breathing hard (and the dust wasn't helping). At one point Justin loudly yawned, and everyone got a good laugh out of that. Because we ate lunch early, we were way behind everyone (many people didn't stop for lunch at all). We were still walking slowly, but at least we weren't stopping in the afternoon. On one of the steeper parts, we passed a fair number of folks. We were walking straight for the Shira peak. 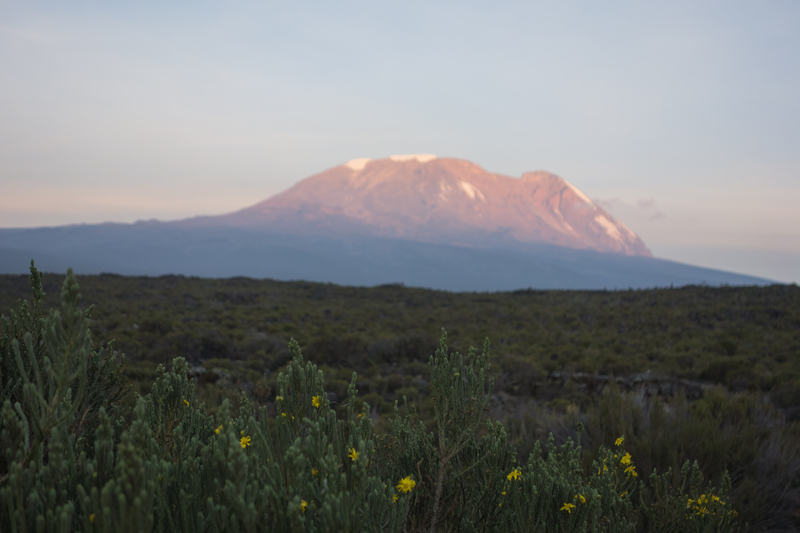 "Mount Kilimanjaro" consists of three peaks, Kibo (the highest), Mawenzi (the most interesting to look at), and Shira (the oldest). As we neared the Shira Peak, we veered left. At that point, we got cell coverage, and Joseph asked if we wanted anything. Justin (only half jokingly) said all he wanted to know was whether Arsenal had actually signed anyone good at the transfer deadline. He was surprised to learn that Joseph knew the answer - yes, they had signed Mesut Ozil, a star midfielder from Germany who Arsenal acquired from Real Madrid. So that was nice to know. 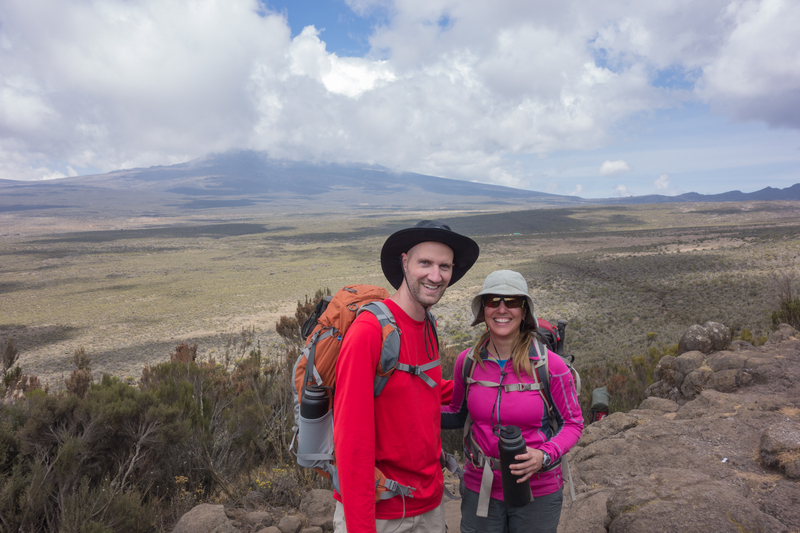 After awhile, we went around a bend to the right and got our first view of Kibo and the Shira Plateau. First, it looked a long way away. 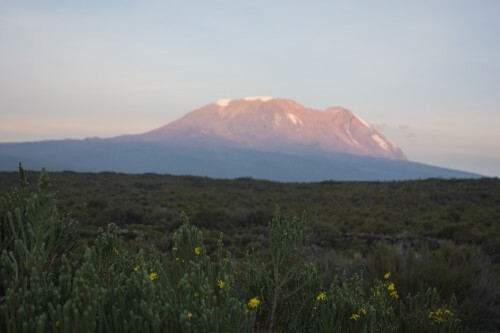 Second, it looked really tall, given that we were already well over 10,000 feet (3048 meters). The last part of the hike was downhill, with Alexi leading the way while Joseph finished up his conversation on the phone regarding supplies for the next day. We saw a 4-striped field mouse, which are apparently common on the mountain. We got to camp (Shira 1 Camp at 11,500 feet, or 3505 meters) just before 3pm. Coincidentally, the people in the sign-in log just before us happened to be from San Diego. We took showers in the shower tent, but only after Crystal broke the tent and they swapped it with the toilet tent. Since it was a gravity shower, we really had to get low for the shower to do any good. Although very cumbersome, we both thought having the tent (and the added expesnse) was worth it. In the late afternoon, we hung out in the dining tent. Crystal showed Joseph her Kindle, he seemed to be a big fan. We also chatted, and talked about how "unsafe" the Western Breach is. It is admittedly a bit more dangerous than the other routes - some people died in a rock slide several years ago - but the odds of something happening are much lower than getting a bad case of altitude sickness, having a heart attack, or getting in a car accident driving to the starting gate. Joseph said he really enjoyed hiking the Western Breach. We also played some cribbage, trying to stay awake. 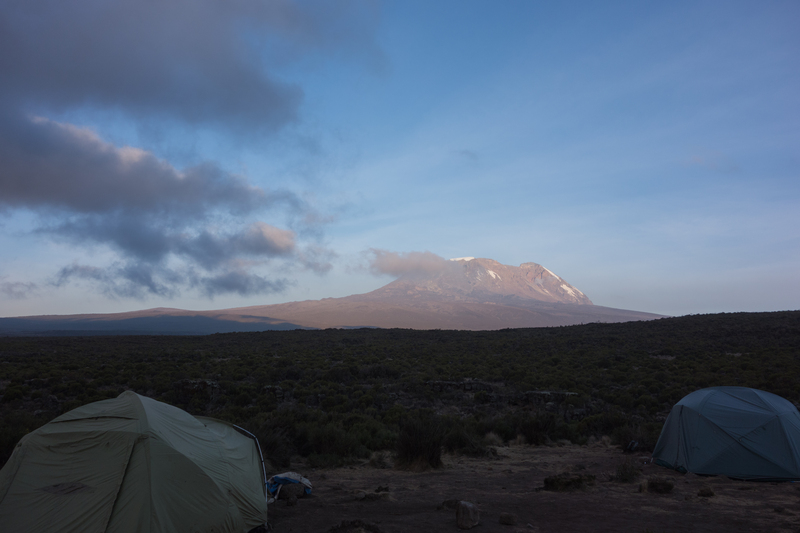 We left the tent to go out and look at Kibo for a nice sunset. Dinner was beef stew and spinach. Once again, we tried to stay up until 9, but again crashed around 8.